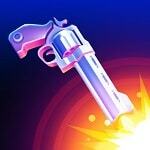 whether you Can reach the top of game Flipping Gun Simulator? Return after a shot a revolver will push away him in an opposite side. It also should be used for object in view achievement.